On this episode of “Dugout Blues,” Jared Massey (Dodger Blue) and I wrap up the first “half” of the season. Clayton Kershaw threw a “light” bullpen session on Sunday. There’s no need for him to rush back, but if anyone is going to come back ahead of schedule, it’s Kershaw. Yasmani Grandal got off on Friday night. He hit three home runs in a 5-for-5 performance. He’s starting to show the form that made him an All-Star last season. Adrian Gonzalez and Yasiel Puig also appear to be hitting better of late. The power is still a bit absent, but them hitting is only a good thing for the Dodgers. Andrew Toles has come from almost out of nowhere to make his Major League debut. He has dealt with anxiety issues that cost him the 2015 season. Now, he’s on an MLB roster. It’s quite the story. 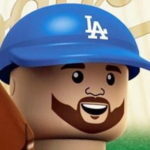 Adam Liberatore has been fantastic this season. In a season that has seen Luis Avilan and J.P. Howell struggle mightily this season, Liberatore has been a pleasant and welcome surprise. I caught up with Jharel Cotton, who pitched in Sunday’s Futures Game. Have a listen to the interview. Also on the minor-league side: Willie Calhoun joined Cotton at the Futures Game, we talk about Baseball America’s midseason Top 100 update, my midseason Top 30 Dodgers prospects, Cody Thomas & D.J. Peters hitting well in rookie ball, Ross Stripling‘s return to Oklahoma City and Julio Urias pitching out of the bullpen for OKC (sigh). We close with a decent Q&A session. Keep them coming, please.